When I last left you, I was making very bad pie puns. I’m sorry to say that this will continue, though at least we are actually making the pies this time around. Though I obviously had a lot of serious pre-pie-ration thoughts, the beginning of making the actual pies was a bit unplanned, for me. Having purchased a carton of buttermilk to test out a pie dough recipe a few days earlier, I realized that most of the carton would expire and go to waste by the end of the week. For some reason, I decided that I could not use it for anything but pie dough. 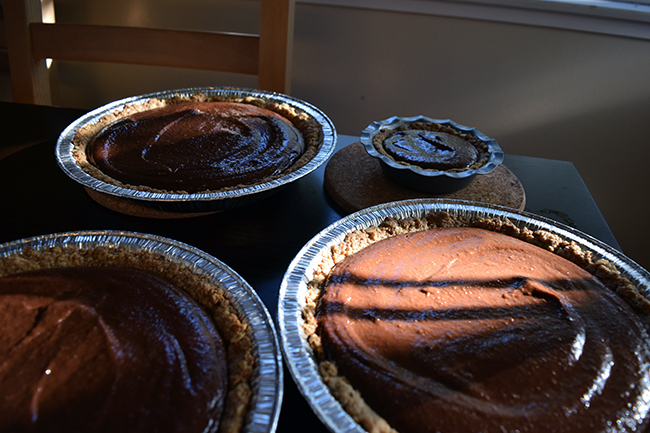 Thus began the several-day saga in which I made 14 pie crusts, which, since unplanned, had to occur in parallel with a SQL class I was taking. I also had recently purchased a rolling pin (remember, I used to use a Campari bottle), so I may have terrified a UPS delivery person with my manic enthusiasm upon arriving at my apartment. I may have also opened all the windows in our apartment to keep the temperature cool enough to coddle temperamental butter. So, I may have temporarily lost my mind, but I have learnings. 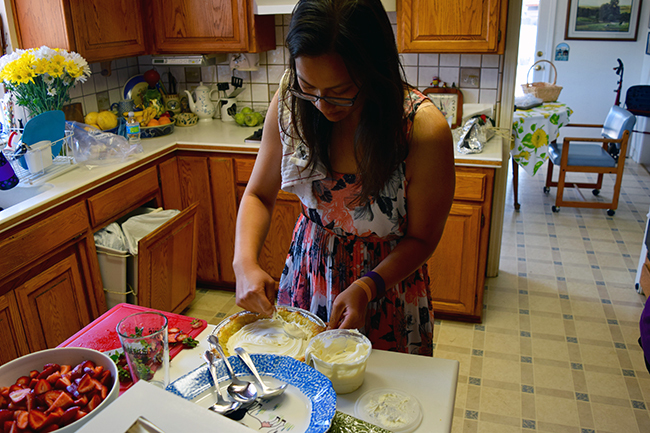 And, really, truly, after the few days of crust daze, the pie-making was all quite pleasant. This time, we actually make the pie. Okay, I mean, it should go without saying, but don’t succumb to pie-mania like I did and let a carton of buttermilk control your life for a few days. But seriously, let’s talk crust-making. 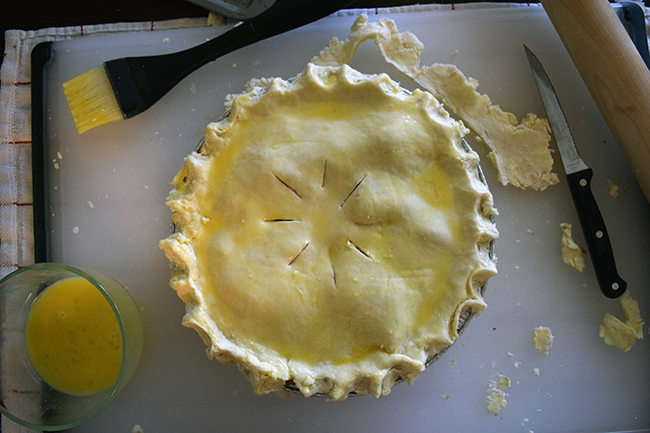 If you’ve made a pie crust from scratch, you’ve probably heard the mix of science and weird mystic kitchen knowledge about pie dough and the importance of keeping it cold. 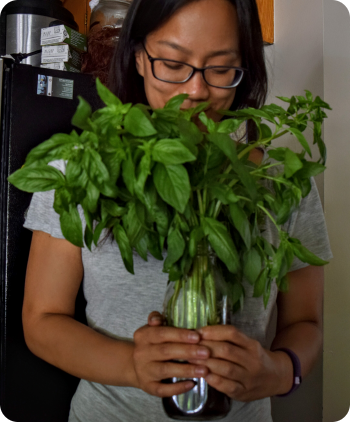 It’s true, and it can be a bit tough, especially when making a large batch of dough. But, don’t panic, because even “bad” pie dough is good. 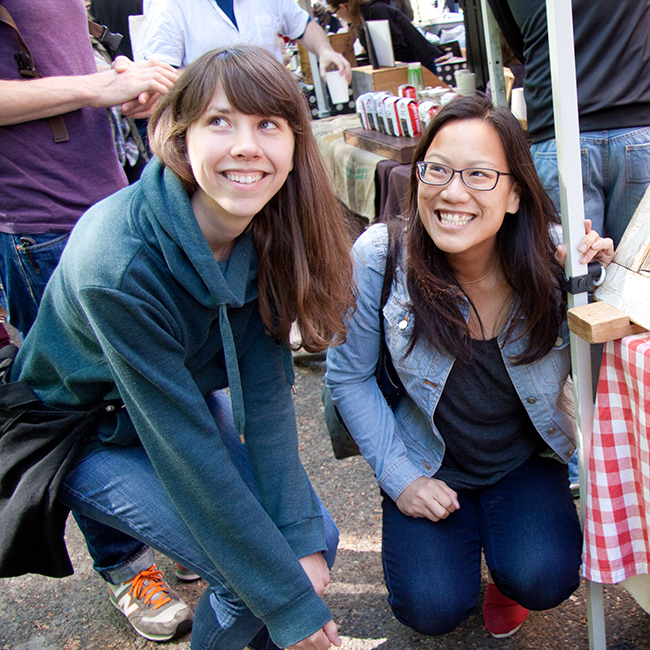 You can’t go wrong with fat and flour, so, seriously, it’ll be okay! For keeping the cool temperature, opening all the windows in your apartment might be a bit extreme. I think working quickly and confidently, and having chilled all my implements (bowls, tools, etc) were effective. And now, let’s talk about crust-baking. 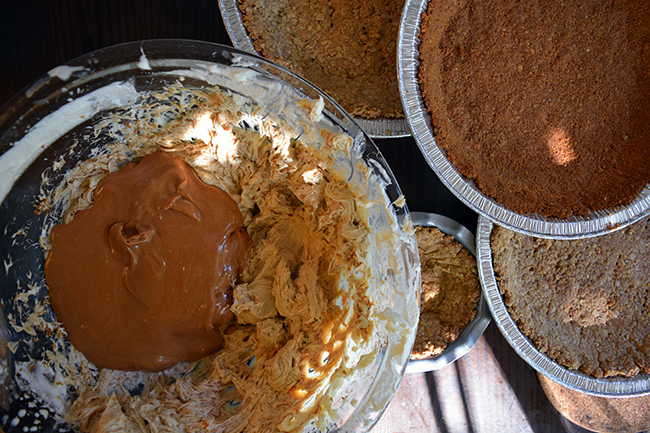 With disposable pie tins, it can be challenging to get a pie’s bottom crust to crisp up. I found it the most helpful to parbake/blind bake the crusts with some extra thermal mass below the tins, covered in foil and pie weights. I have a baking steel, but I believe doubling up the pie tins would also help. The pies were going to sit for a day, so for extra protection against soggy crust, I also egg-washed the bottom crusts. To egg wash, brush egg on the crust after the blind bake (remove the foil first, of course), and then pop it back in the oven for a minute, just to set the egg. For thickening a fruit filling, I found that I liked quick-cooking tapioca the best. And, without fail, I needed to cover the edges of a pie with foil to keep them from browning too much during baking, so now I just do that straightaway. Pies can sit out about a day and be totally fine. To minimize time sitting out but also minimize the amount of baking I’d be doing during wedding festivities, I blind baked/egg washed the bottom crusts for the pies two days before the wedding at home. I brought a cooler filled with crusts, unbaked dough for top crusts, and fillings to the wedding location, and then finished the pies the day before. This left me with just garnish and assembling the fresh fruit pie the day of. Have an amazing accom-pie-ce! 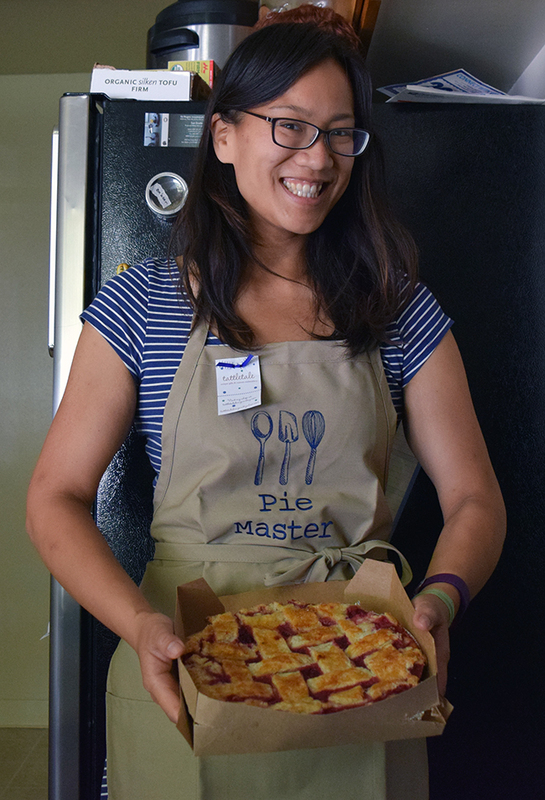 Seriously, talking pie-nutia (minutia… that’s a bad one) with this lovely lady, who banged out 18 incredible pies, was amazing. You da best. 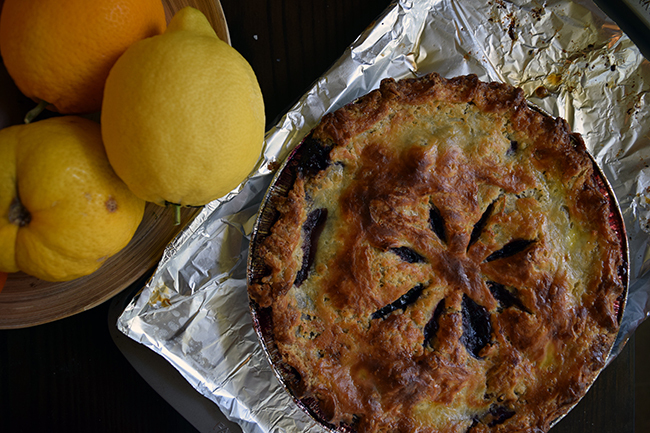 Enough with the extremely detailed talk about crust and heat mass… what pies did I end up making? I made slightly adapted versions of four tried and trusted recipes, and I cobbled (hah!) together my own for my fruit lattice pie, which I’ll post next! This amazing apron courtesy my now married (!!) friends; thanks, loves! I feel truly unstoppable wearing it. And thanks to roomie4life SXN and blogger BFF Kim for a couple of the photos! 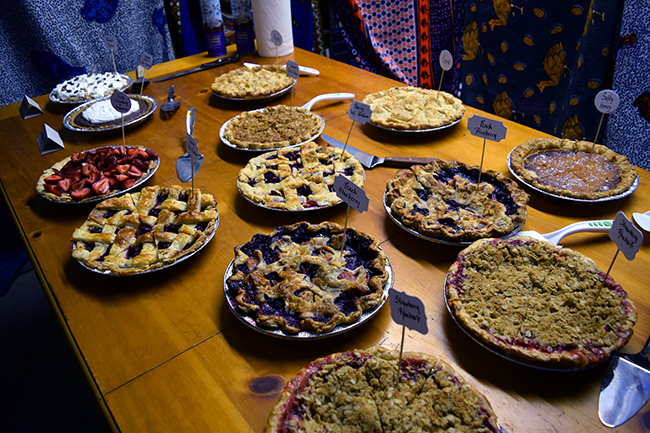 This is the second post in my series on how to make pies for a wedding! Part 1 has tips on preparation, and part 3 (coming soon) has a recipe I developed for Cherry Chocolate Pie.